This storybook Bible is written as a graphic novel, which is so appropriate for the younger generation (including many Millennial adults)! The stylistic illustrations are set with succinct captions, allowing the Bible to cover large spans (even whole books of the Bible) in few pages. I was especially impressed with how this Bible captures the overall history of the Bible so thoroughly. There are many stories and details that are missing (as one would expect with a children’s Bible), but the historical outline is comprehensively presented in a linear format. 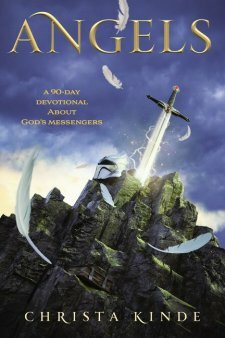 This may be the best “big picture” storybook Bible I have encountered. The transition between the Old and New Testaments is particularly well explained, and the 400 years of silence has its own full page. There is also a difference in the OT and NT illustrations (from dark and sketchy, to brighter and more defined), which presents a nice metaphor on the changing spiritual atmosphere with the incarnation of Jesus. The Bible even ends with (a heavily abridged version of) Revelation, which surprised me; but it is done quite well considering the difficulty of capturing such a complex vision. I would have liked a picture of the throne room and/or a more vibrant New Jerusalem (there is a small one)–but even so, I am impressed with how much is illustrated! It is also fun that each of the character’s is given a “superhero” name (e.g. Adam is Earthman; Deborah is The Iron Maiden; Elijah is Rainmaker; Nehemiah is The Governor; John the Baptist is The Voice; some of the major characters receive more than one name). But as creative as the superhero names were, it might be less confusing to stick with the real ones, at least for practical purposes. 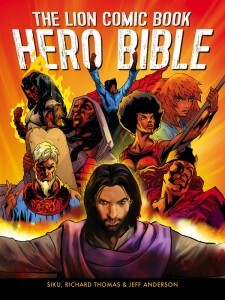 After reading the entire Hero Bible alone, I have now been reading it with my almost-six year old, and he is glued to the stories. We collect Bible storybooks and rotate through them, and this is one of his favorites right now. It is a bit dark–but then so is much of the biblical content!! Some of the stories (especially in the OT) have pretty graphic “bad guys”, war scenes, and violence. I like that the narrative does not glaze over the difficult parts of biblical history, and it makes for good discussion. But, this really is aimed more for teens than younger kids, and some parents/teachers may still be uncomfortable with parts of it.